Uncategorized > What’s in Bloom at the Wild Gardens of Acadia? What’s in Bloom at the Wild Gardens of Acadia? One particular plant that shines in the May landscape is the shadbush (genus Amelanchier). Shadbush or shadblow, serviceberry, sarvisberry, Juneberry, sugarplum, Saskatoon, or whichever common name the genus is known by, is a member of the Rose family. Shadbush is so named because its bloom time in New England occurs when the shad fish return to freshwater to spawn. 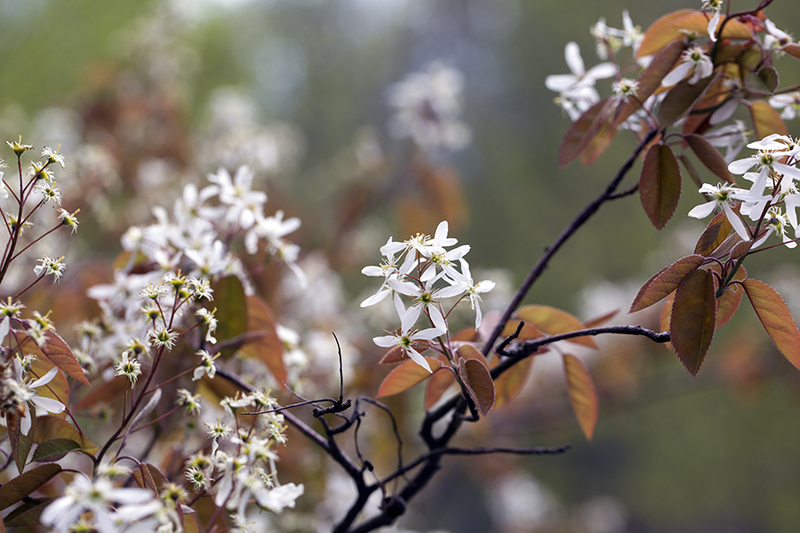 There are many stories of how Amelanchier got its other common names. I won’t delve into that here, but it is worth reading about! Depending on the species, Shadbush can be a low growing, multi-stemmed shrub on the side of a mountain to a small tree on the sunny edges of a deciduous forest or peatland. Shadbush can sometimes be overlooked, except in May. In May, the reddish-copper leaves of some species and white starry flowers stand out from the grays, browns and pale greens of the surrounding woodlands. One might never know how prevalent this shrub is in Acadia until it is in full bloom! All too soon, however, the flowers fade and the petals fall like snow upon the ground. In June, the fruits ripen from green to a reddish/purple. Shadbush produces a pome fruit with juicy flesh surrounding an inner core that houses the seeds, like an apple, though much smaller. The fruits are delicious for humans, and are also a significant food source for many birds and mammals, such as thrushes, cardinals, waxwings, robins, chipmunks and squirrels. Several species of butterfly larvae feed on the leaves and it is an important pollinator plant, as well. There are seven species of shadbush native to Acadia National Park. Most can be very difficult to distinguish from one another, since this is a plant with many hybrids and a complex reproductive biology. At the Wild Gardens of Acadia, we have Eastern Serviceberry (A. canadensis), Smooth Shadbush (A. laevis), Intermediate Shadbush (A.intermedia) and Thicket Shadbush (A. spicata). Of the other three species, Downy Shadbush (A. arborea) is found in the richer forests of Acadia, and both Mountain Shadbush (A. bartramiana) and Nantucket Shadbush (A. nantucketensis), a rare species, are found at higher elevations. 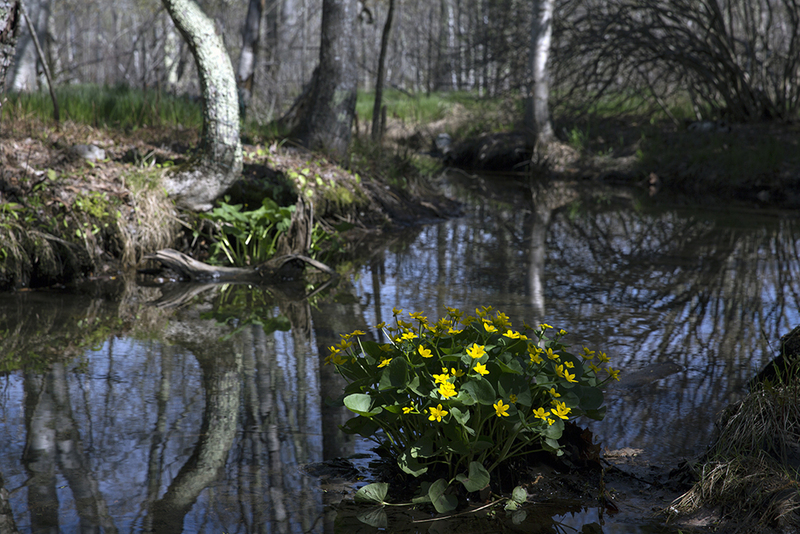 In bloom at the Wild Gardens: : Marsh Marigold (Caltha palustris), Dooryard and Northern White Violet (Viola sororia and V. blanda), Hobblebush (Viburnum lantanoides), Bluets (Houstonia caerulea), Low Sweet Blueberry (Vaccinium angustifolium), Wild Columbine (Aquilegia canadensis) and Jack-in-the-Pulpit (Arisaema triphyllum).